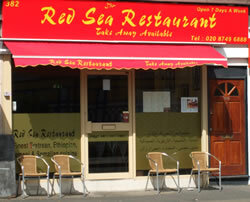 Although the Red Sea might bring images of biblical partings to mind, the Red Sea restaurant on Uxbridge Road is more like a cultural coming-together. It is predominantly African in nature (Ethiopian/Eritrean), but with the Middle East and Europe mixed into the equation, it is a microcosm of Shepherd’s Bush life. The menu, written in English, Arabic and Amharic, the language of Ethiopia, is long and varied, including everything from spicy Abyssinian dishes to good old spaghetti Bolognese. Even the fussiest eater would find something suitable here. Vegetarians might panic, as, apart from several starters, only two main dishes are flagged up as being meat-free. But look hard enough, and on the page of Abyssinian dishes, there are three or four veggie dishes hiding at the bottom, all unmarked. We started off with humous and okra which was more Mediterranean than Red Sea, but we also tried the intriguing sounding ‘Fata Tamer’ or ‘bread mixed with dates’. The two main ingredients are grated and then fried together, creating a sweet dish, more like a dessert, but pleasant enough. Then, we were each served a plate of injera bread, which is flat and pancake-like and made out of teff flour (an Ethiopian/Eritrean cereal crop, rather like millet). The bread has a slightly sour taste, and, frankly, is not something I would be rushing back for. But I would be back in flash for more of the Red Sea Restaurant’s fragrant rice, flavoured with cloves, cumin and cardamom. Once a whole mountain of it had arrived on my plate, the sour bread didn’t stand a chance. For our main courses, we chose lamb stew and spicy vegetables from the long list of Abyssinian dishes, many of which had a red chilli pepper hanging over them. My dish of five different vegetables, including spinach, brown lentils and yellow peas, was beautifully presented in a terrine and was spicy heaven. The lamb, meanwhile, was heaped up in a bowl on more injera bread, more palatable this time because it had soaked up some of the meat sauce. Unlike its geographical counterpart, the Red Sea Restaurant does not offer the best of views, as it sits opposite the Soviet-style tower at the top of Blomfontein Road. If you prefer your scenery to be a little more uplifting, the pictures on the restaurant walls provide a welcome distraction: African scenes, tourist shots of Yemen and a London scene, featuring a Routemaster bus and a black cab. And to add to the African/Middle Eastern/Western visuals, the background music was pop in Tigrinya, one of the many languages of Eritrea. There was a steady flow of customers at the Red Sea Restaurant on the evening we visited, some eating in, some taking away, many greeted as old friends by the manager. And, indeed, he took great care of his customers, patiently answering our incessant questions and running into the street after one diner who had left his jacket behind. After our starters and main courses, including the rice mountains, we were so full that we only managed one dessert between us: a muhallabia. This milky pudding, topped with pistachios and sultanas had a rich, rosewater flavour and the lack of space in my stomach was quite regrettable. Just when we thought we had finished our meal, the highlight of the evening came. We curiously, but guiltily, ordered Abyssinian coffee for £5 – far more expensive than any of the other hot drinks on offer. The manager warned us that it would take a while to make. And so it did. After about five minutes, the waitress came to our table to proudly show us some smoking coffee beans which had just been roasted from green to brown. And after this came the boiling…20 minutes of it. I’m guessing the Ethiopians and Eritreans enjoy a fairly relaxed pace of life. As typical takeaway Londoners, we had almost given up hope, when the waitress arrived at our table with a huge, mysterious wicker basket. She took off the lid to reveal…..popcorn and Fox’s glacier mints – presumably a modern addition to the traditional coffee service. Next came a tray with Turkish-style coffee cups, a smoking incense burner and a clay pot, containing the coffee. I have to admit that after all the roasting, boiling, waiting and ceremony, my expectations of the coffee were extremely high; in reality, the coffee itself was, well, ordinary. Not spicy or aromatic or fragrant or even particularly strong…..just quite plain. We drank six cups out of our clay pot, and there was still plenty left - which explains the price: it’s meant to share. A very filling dinner for three, including the very special Abyssinian coffee experience, came to just over £40. There’s no alcohol on the menu at the Red Sea. The Red Sea Restaurant is open 7 days a week from 1200 – 2300 and will soon start opening for breakfast too.